183 cm / 6’” tall and is wearing size 2. 24 sts & 32 rows = 10 cm / 4” over stocking stitch on 3.75 mm needles after blocking. Woodman is worked flat from the bottom up with shaping at the front neck edges and sides. 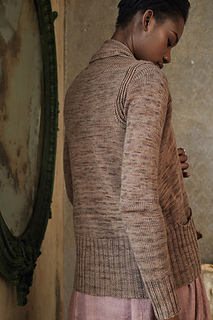 Once the body is complete, stitches are held for the fronts and the back is worked with exaggerated armhole shaping. Stitches are picked up along the back and the held front stitches, epaulettes are worked using welts, before the sleeves are worked from the top down with a short row sleeve cap. 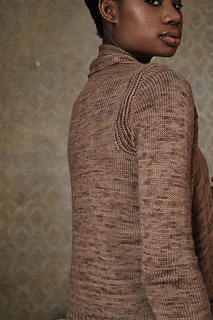 Once the sleeves are complete, a neckband is picked up and worked outwards from the front edges.